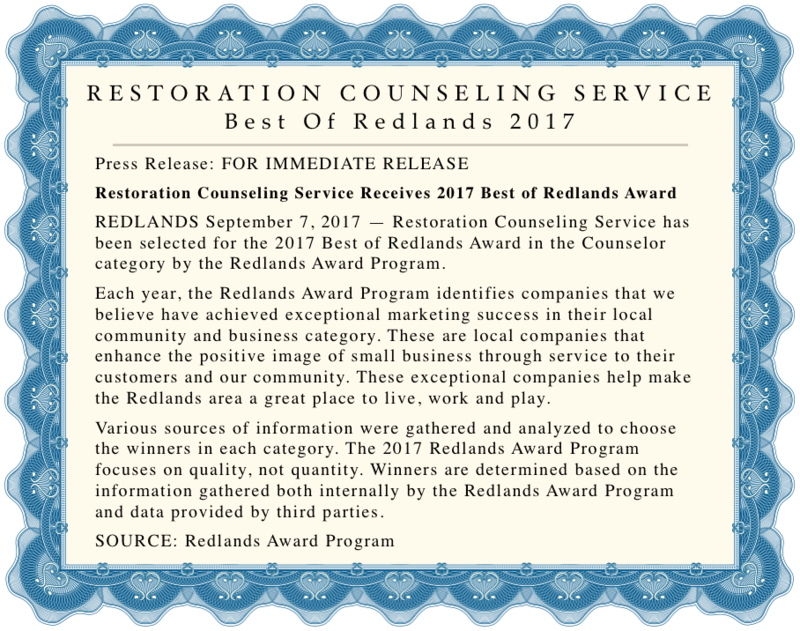 Restoration Counseling Service exists to help you be your best by offering premium counseling services with an experienced staff. Even when little problems crop up! We have a staff of highly trained and skilled counselors and we are here for you. We specialize in marriage counseling and individual counseling. Sometimes life and it's troubles can seem overwhelming. Maybe your marriage is in trouble or an affair has rocked your world. Maybe your small child or teenager is out of control. Maybe your life feels out of control. Maybe what should be a small problem feels like a very big problem. Maybe you think no one cares. We really do care about you. You're not alone in your troubles. You've found a safe place and someone you can trust. And though we can't offer quick fixes, you'll find credible advice and practical solutions for whatever problems you are facing. More importantly, you will find the hope you need for tomorrow. Or maybe things are currently going well for you, but you want to make sure they stay that way. Your marriage is good and you want to continue to make it better. Or, you desire to be proactive in your emotional health and the health of your most important relationships. After all, we know that most things in life fall apart when we don't properly care for them… our relationships are no different. Today you're one step closer to becoming all that you were created to be! Whether you are seeking marriage counseling, premarital counseling, children's counseling, family counseling, or individual counseling our goal is to connect you with the right counselor to help you uncover your true potential and start leading a life that is worth celebrating. You may need help working through grief, depression, anger management, marital infidelity or an affair, sexual addiction, an eating disorder, self harm, or self esteem issues. While we can't change difficult situations of the past, we can work together to better understand and resolve challenges in your life. You do not have to be defined by your past, you can be refined as you move into your future. Challenges in life, handled well, will make you a better, stronger, and happier person. By applying proven approaches and techniques tailored just for you, we will help you to uncover long-standing behavior patterns or negative perceptions that may be holding you back from experiencing a more fulfilling and meaningful life. If you're looking for extra support and guidance through a challenging situation or you're just ready to move in a new direction in your life, we look forward to going on that journey with you as you are being transformed. You will also find other helpful information here as well. There is a page dedicated to the background, qualifications, and contact info of each counselor (therapist) and clinician on our staff. There are recommended books, answers to Common Questions, blog articles, and more that will be helpful to you. And you can even check our schedules, as well as book your appointments here so we can spend more time on what matters the most to you. There is also a contact form to assist you if you need more information about counseling or our other service. If there is something you are looking for on this web site, but don't see, please use the "Contact our Webmaster" link on the bottom of this page and just ask. We will always do our best to respond to you quickly. You will also find our main phone number at the bottom of every page and each counselor's direct number on their bio page (listed under the Counselors tab near the top of the screen). Whether you are in Redlands, Yucaipa, Highland, Loma Linda, Beaumont, Banning, Calimesa, Grand Terrace, Riverside, Colton or the surrounding areas of the Inland Empire, our offices are just a short drive away in beautiful downtown Redlands. After you determine which one of our counselors is right for you by calling us or visiting their profile pages on this site, make an appointment and get started on your journey today. Additionally, we invite you to "interview" us just to make sure we are right for you. Take advantage of our FREE 20 minute phone consultation, it will put your mind at ease about the kindness and ability of our counselors. And, with ongoing sessions as low as $80.00, finding hope, help, and healing may be more affordable than you thought. 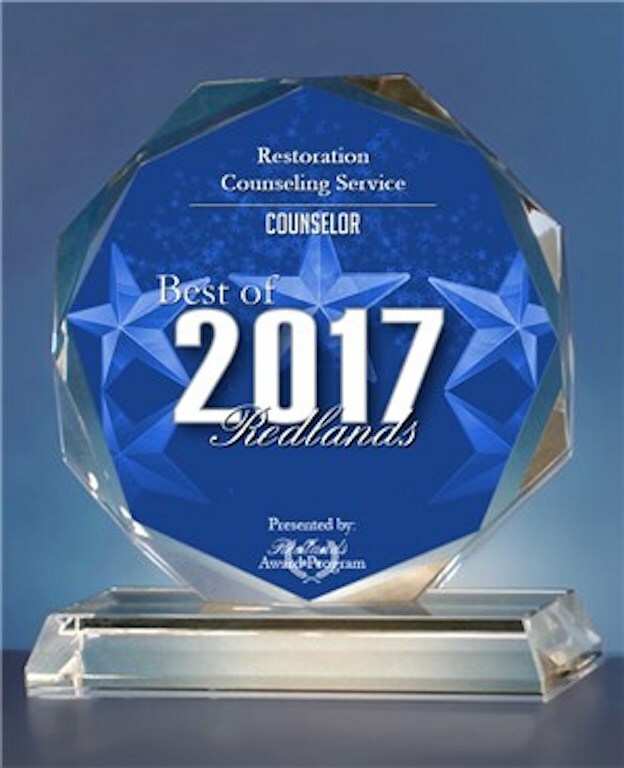 Find out why Restoration Counseling Service, often called RCS, was chosen as the Best Counselors in Redlands! For a larger map or driving directions, click on the map below. Use the links below to follows us or leave us a review about your experience with us. Many people just like you say that the free articles and relational wisdom that we post weekly are well worth it!